I don't get why you would want them to change the background to match the characters. If I see a black spot on a blue sheet of paper, I'm not going to wonder why the rest of the sheet of paper isn't black, or desire the rest of the sheet of paper to be black. I'm going to wonder why the sheet isn't completely blue, and I'm going to want it to be completely blue. While I understand why they went with what they did, I still dislike it. I'm not even asking for a completely 2D game (although that would be ideal), nor am I asking for/desiring a super realistic game, but I am desiring a game that is aesthetically consistent. So far, Bloodstained is not that. Personally, I appreciate the aesthetic differences between character & background. I'd gotten used to the controlled character standing out from their surrounding environs since the days of Harmony of Dissonance. The sprites of the controlled characters in the DS games even stand out (e.g. don't even look like they "truly belong") to me, especially with the black outlines they had. I understand why some people are still upset about the character/background shader choices, but to me? It's just the same situation as past games. I'm perfectly fine with Miriam & the other two playable characters standing out in the gorgeous Castle environment, because that's how 2D Igavanias have always been. It took me a time to answer this discussion because this thread definitely wasn't for this, but who am i to dictacte what people talk about in my threads, right? I'm not gonna answer you all because my opinions are already known. I'm fine with the direction the game is taking regarding everything so far. I like the cartoony characters inside the realistic environments and i actually enjoy how that stand out. To me, it's part of the game's charm and helps the game to look different from other games from the market, so...I don't have much to comment here. because to me the visual design of the characters and enemies look a helluva lot more visually appealing to me. The environments don't pop at all. If I enjoy the visual designs of the characters in a game like Viewtiful Joe than why would the backgrounds be realistic? The backgrounds and the characters match the same style here and it works due to it. 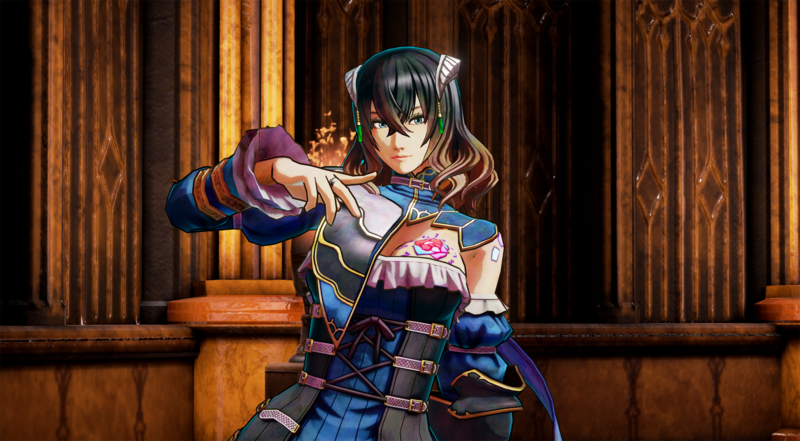 So to me I wouldn't want the characters in Bloodstained to look more like the environments because the environments are my issue with the game, the characters look great. so to me the problem was never... why can't you make Miriam more realistic like the second pic to fit the more realistic background. It was why didn't you apply the shader and more of a 2d art style to the background to fit the good shader over the meh shader. To me it feels like they kept the background like the original shader but improved the character one. So I settled with the better shader and the more realistic background because there wasn't any other choice really. My HOPE was they'd add more color to the backgrounds so at the very least it'd pop more. I mean, he likes the background and you like the character, I think we get each others' points. You can't tell someone they don't like something. It is what it is at this point. The curse of being tagged. I don't necessarily dislike the stylized art of Viewtiful Joe. I just don't think it belongs in a game like Bloodstained. It doesn't belong in Castlevania either. Castlevania was never realistic for sure, but it never looked THAT stylized. Regardless of all this, I would prefer a completely stylized game like CastleDan is suggesting over the mismatch we currently have. Aesthetic consistency will always trump two clashing styles, regardless of how good each style looks. In other words, please just give us one or the other. Stylized or realistic, I don't care as long as it's consistent. Yeah, I get it you rather the realistic look to the whole game, I'd prefer the stylized look of the characters for the whole game. Your last sentence is a great way to close this, we both would like more consistency. In my case it'd be making the backgrounds pop more and a bit more stylized or visually appealing. To you it's tone down the characters to fit the backgrounds. The common thread is ...consistency. There's also even the opinion of someone like Galamoth's where they thought the games were always kind of like this regardless. Eh, it's too hard to say someone is/isn't seeing something a certain way when it comes to art. Glad everyone had a say in it though.